Fan theories and the vast works of A Song and Ice and Fire go hand in hand, and Game of Thrones has spent the last couple of years bringing a few of the biggest of them to life. But one this upcoming season might finally tackle is the legendary Cleganebowl—a duel fans have been chomping at the bit to see for ages. So what is Cleganebowl? Basically, it’s what some fans see as the culmination of the story arcs of Sandor “The Hound” and Gregor “The Mountain” Clegane—two brothers who are very very eager to kill each other. Pretty much from the get go, in the show and the novels, it was established that the Clegane brothers were not loving siblings. Years of bullying and torture at Gregor’s hands—including the burns across his face—taught Sandor to despise his brother, and Gregor’s own monstrous actions during the sacking of King’s Landing (and his eventual knighthood) also gave the younger Clegane a distrusting view of the world of chivalry and royalty. Although when we first meet them in the show the animosity is clear, it’s also established that the two are both still loyal to House Lannister despite their deep hatred of one another. 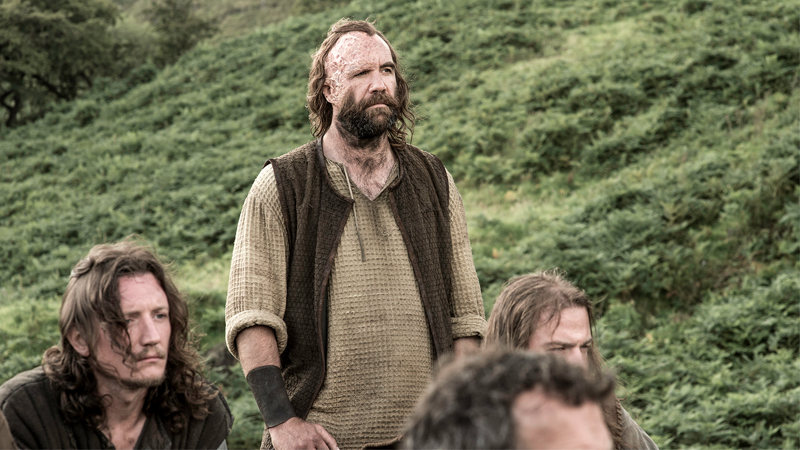 Since those early days, though, Sandor and Gregor have gone on wildly divergent paths. Gregor remained at Cersei’s side, eventually perishing in a deadly duel with Oberyn Martell, only to be resurrected as a zombie-esque silent bodyguard for Cersei, created as an unstoppable Champion for her in her planned trial by combat against the Faith. Sandor, on the other hand, abandoned the Lannisters and fled King’s Landing after the Battle of Blackwater, journeying in the Riverlands with Arya Stark as his captive for a time. Eventually, an encounter with Brienne of Tarth led to her royally beating the crap out of him, and Arya used the battle to escape from both of them. That’s more or less where the books left the Hound (although in the books he received his wounds from two of Gregor’s men), but the show has since revealed that Sandor survived after Brother Ray and his followers encountered him after his duel. Ray nursed him back to health, and Sandor seemed content to lay down his sword and live with these simple people, until tragedy struck, when they were all massacred by former members of the Brotherhood Without Banners. Sandor picked up his sword and hunted them down, until he found the actual Brotherhood, who were hanging the rest of the murderers for their crimes. Sandor has since joined the Brotherhood Without Banners, and trailers for season seven have since confirmed he’ll at one point meet up with Jon Snow, potentially allying with him as the pair journey beyond the Wall for reasons currently unknown. Although their paths are radically divergent at this point, fans believe there is a future duel between Gregor, as Cersei’s Champion, and Sandor, chosen somehow to represent the Faith, given that he was saved by Brother Ray. Or, they thought it was meant to be, until Tommen ruled that trial by combat wouldn’t be allowed, leading to Cersei blowing up all of her enemies at the climax of season six. Since it first emerged, the idea of the jokingly-dubbed Cleganebowl being “confirmed” whenever the slightest bit of news about either one of the brothers has emerged has become a long-running meme in the Thrones fandom. It’s even got its own subreddit, which, before last week’s release of a new trailer for the show, was full of in-jokes and theories as to how the duel could eventually come about, and is now mainly people screaming their heads off that the theory may finally be coming to pass. So Could Cleganebowl Actually Happen on Game of Thrones? Ever since Sandor returned in the TV series following his duel with Brienne—and confirming the hints dropped by Martin in the books that he’d survived there, too—fans have assumed that Cleganebowl is inevitable, even after Tommen’s banning of the trial by combat. But the latest trailer for the show released last week contains a blink-and-you’ll-miss it shot that many fans believe all but confirms we can expect the fated duel to go down in this penultimate season. Although obscured by sunlight, the shrouded figure in the trailer does match up with Sandor’s hair, and the costume matches one seen in a recent promo for the show worn by him. 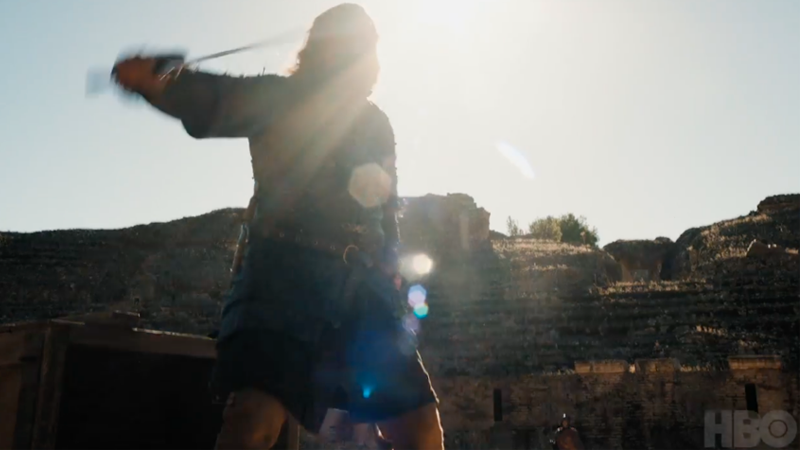 Sandor Clegane could be drawing his sword at anyone in this shot, but fans have taken it to be him drawing his sword at his brother because of the brief glimpse at the location around him. It looks far different to the chilly Northern climes we’ve been seeing Sandor in over the last season, and we speculated in our trailer breakdown last week that this could be part of a rumoured major coming together of several members of the Game of Thrones cast at a location called the Dragonpit, a pivotal landmark just outside of King’s Landing. What draws people there is currently unknown, but with rumours that both Clegane brothers are a few of characters that will visit the Dragonpit next season, it seems like after years of waiting, Cleganebowl has finally been scheduled—if if it’s not ultimately as part of Cersei’s trial by combat any more. 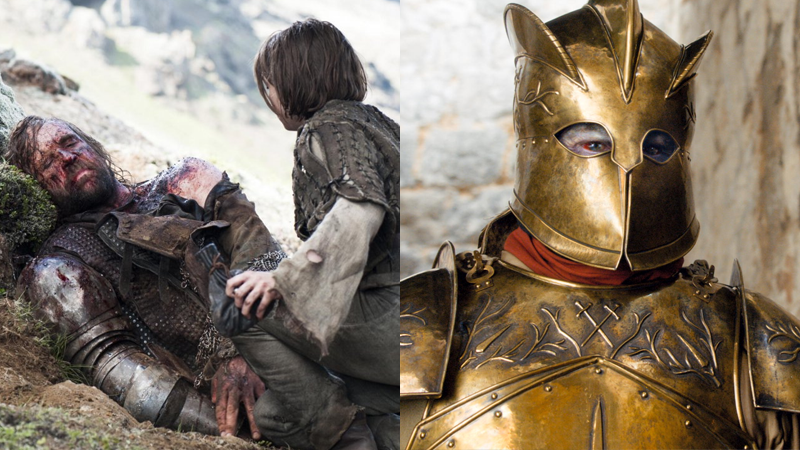 Beyond the narrative satisfaction of watching these two finally fight it out on screen, there are two other reasons fans are certain Cleganebowl is on the way, and they’re both from George R.R. Martin’s novels—even though there’s actually not as much hard evidence in the books as the show, simply because the show has advanced well beyond where A Dance of Dragons left off. In the books, we last properly saw Sandor Clegane in A Storm of Swords bleeding out after his duel with Brienne, so we don’t know if he survived as he did in the show yet. That said, there is evidence: in A Feast For Crows, Brienne’s journey across the Riverlands in search of the Stark children lead to her coming across a monastery lead by a man called the Elder Brother, and a grave digger bearing remarkable physical similarities to Sandor, including his burn wounds, but with his face obscured. The Elder Brother told Brienne that the “Hound is dead,” while Sandor himself was “at rest,” which obviously implied he’s dead, but more likely refers to the younger Clegane giving up his life as the Hound and, no longer fighting, angry, or bitter, has found peace. Meanwhile it’s not been completely confirmed that Cersei’s ominous bodyguard is even Gregor Clegane in the books. Although the show has openly transformed Gregor into Cersei’s zombie-esque body guard, the books haven’t. There, the giant, silent knight is given the name Ser Robert Strong, but is implied to have been an experimented-upon Gregor, either through science or necromancy, and that the Mountain may have been the vessel, but there’s much more going on with him. So there’s a chance Ser Robert Strong might not really be Gregor, although it’s unlikely. Regardless, simply because we’re still waiting on The Winds of Winter’s arrival, we don’t know if the books are heading in the direction of the two Clegane brothers ever meeting again, let alone fighting—although, unlike in the show, the original theory of them meeting as part of Cersei’s future trial is still a possibility there. When your tears have drowned you, the valonqar shall wrap his hands about your pale white throat and choke the life from you. “Valonqar” means “Little brother” in High Valyrian—and while book fans have speculated that it’s highly possible that the Valonqar is either Tyrion (who, in both stature and by blood, is Cersei’s little brother) or Jaime (more of a technicality as, although Cersei’s twin, was born minutes after her, making her the oldest), Cleganebowl fans believe the Valonqar is actually Sandor Clegane. Because Maggy’s prophecy simply tells Cersei “the Valonqar” and not “your Valonqar,” the potential for an unrelated little brother to kill her could potentially mean that Sandor bests his older brother Gregor in the trial by combat (which, as far as we know by the end of A Dance With Dragons, is still a thing in the books), helping sentence Cersei to her death. Of course, since this part of Cersei’s prophecy is only mentioned in the books, it doesn’t have any relevance for the show—although it’s certainly possible that if Danaerys does conquer Westeros in season seven, Cersei may face another trial. She’d certainly choose Ser Gregor, and Sandor would leap at the chance to finally take out his brother. Game of Thrones returns on July 16, so we won’t know for sure if the Cleganebowl will take place this season, in the final season, or never. But many, many fans have already bought their tickets, and can’t wait for the fight to begin. Has Jon Snow's True Name Been Revealed?